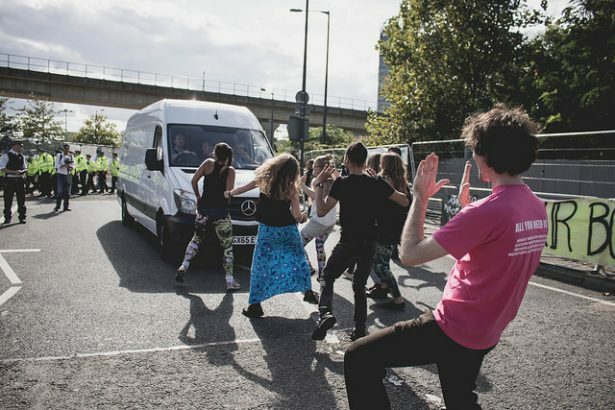 Preparations for London's DSEI, one of the largest arms fairs in the world, were targeted with a diverse array of creative and disruptive actions. 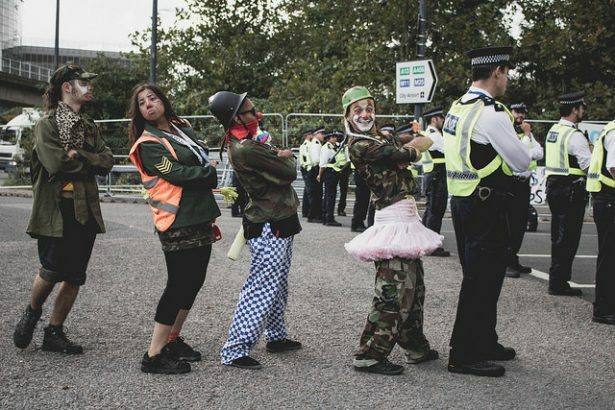 In London, thousands of protesters have been taking direct action to shut down one of the world’s biggest arms fairs. The Defence and Security Equipment International, or DSEI, opened on Sept. 12, but the exhibition center where it is held was repeatedly blockaded during the week before it began, as activists took action to disrupt the preparations for the fair. Over a hundred people have been arrested, amid rumors that the setup of the fair was days behind schedule. 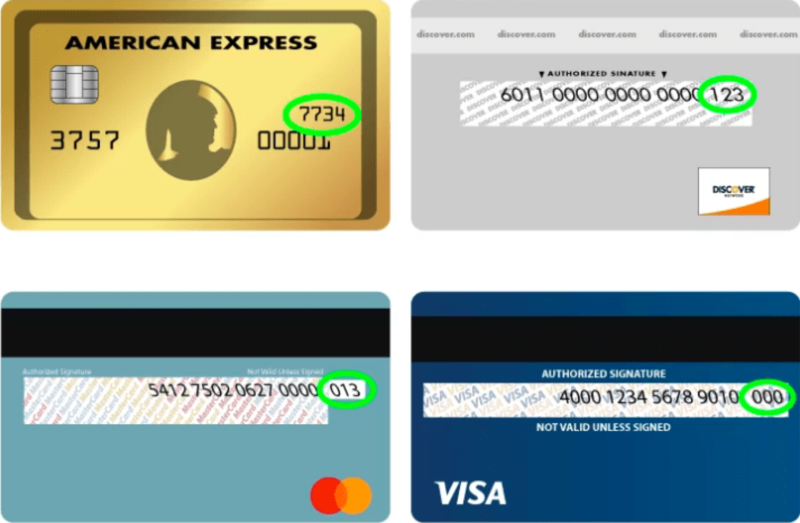 This marks a major escalation on actions in previous years. It appears that the sheer scale of the resistance over the last week overwhelmed the police and organizers of the event, as did the creativity and determination of the myriad of groups who were involved in the protests. Each day was organized by different groups that make up the Stop the Arms Fair coalition to allow them to plan their own actions alongside like-minded people with similar concerns. The various themes included Palestine solidarity, No Faith in War, No to Nuclear and Arms to Renewables, and solidarity beyond borders. There was also an academic conference at the gates, with a Festival of Resistance and War Stops Here seminar over the weekend. This approach allowed groups and campaigns that have not typically worked together to find common cause in resisting the fair. Those who wanted to focus on their specific action were able to do so, confident that just as much energy was going into the other days of resistance. It also allowed people new to the movement to find a group of people they feel comfortable taking action alongside. As new faces become involved in the campaign, a sense of “positive feedback” has grown, as the energy put into one action reflects back in the work of many others. 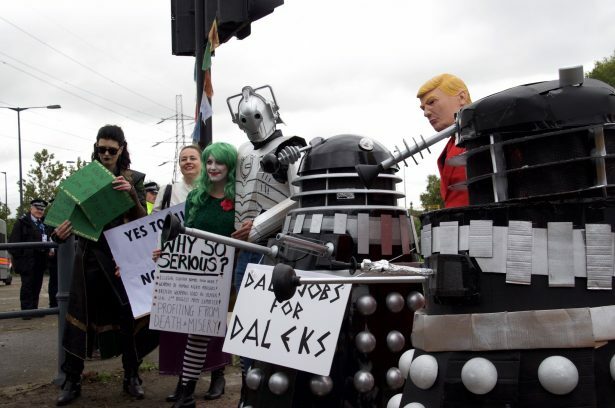 Having such a diverse array of participants led to a wide range of creative and humorous actions, including the “super-villains picket the arms fair” action — the exhibition center where DSEI is held also holds regular sci-fi conventions — with a Dalek from “Doctor Who” reminding people of their legal rights before being arrested. There were also numerous cases of affinity groups working together effectively to put disruptive blockades in place. 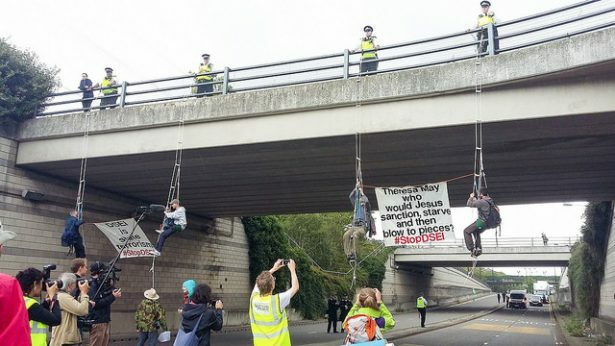 For instance, as a lock-on was finally removed from the road by a police cutting team during the blockade organized by faith groups, others rappelled from a nearby bridge to block another road. DSEI takes place in London’s docklands every two years. Over 1,500 companies take part, exhibiting weapons of war to over 30,000 people, including military delegations from countries with appalling human rights records and countries at war. Illegal equipment and weapons have regularly been found to be marketed at DSEI, including torture equipment and cluster munitions. It’s important to note, however, that those organizing against DSEI do not simply want a clean, legal or sanitized arms fair, they want to stop the arms fair altogether. DSEI is organized by a private company called Clarion Events, with the full support of the British government, which extends official invites to military delegations around the world. 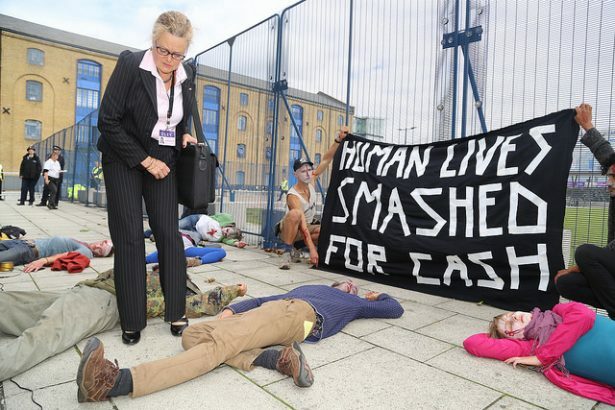 Resisting arms fairs like DSEI is important, because they are one of the clearest, starkest manifestations of the arms trade; actual arms sellers marketing the equipment of war they build to militaries looking for the latest technology. Already this year, arms fairs in Spain, Canada, Israel and the Czech Republic have faced direct action from local campaigners, with Seoul’s ADEX and Bogota’s ExpoDefensa due to take place in the coming months. 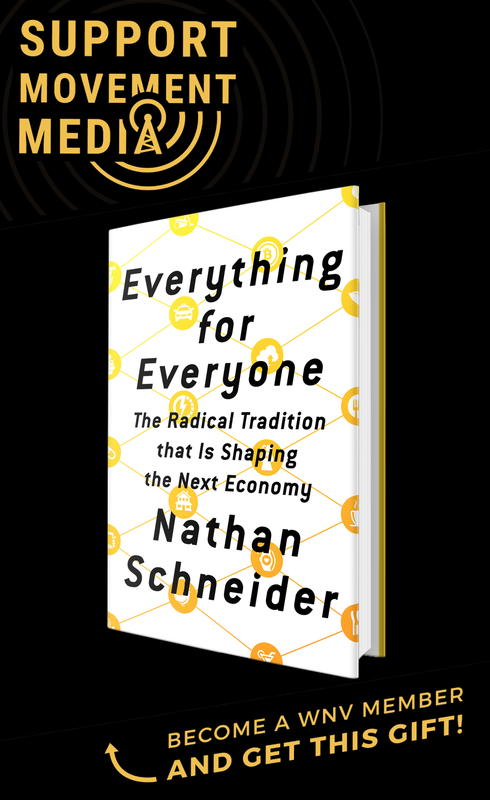 The arms industry — like all industries — relies on a social license to operate, which means that as well as receiving formal legal backing it also needs the support of wider society. This social license allows the arms industry to wrap itself in a cloak of legitimacy, and resisting the arms trade wherever it manifests is one clear way to challenge this social license. At the moment, the arms industry assumes its activities are almost de facto legitimate, but that is in part because most people rarely, if ever, think about its existence or how it operates. Taking direct action against events like DSEI allow us to “point the finger” and draw attention to the wider arms trade, questioning it’s legitimacy, while also directly impeding its ability to function. A few weeks before the fair was due to begin the newly elected mayor of London, Sadiq Khan, said he wanted to see DSEI banned, but didn’t have the power himself to stop it. Mega-events like DSEI can be relatively difficult to disrupt in a substantial way. That is one reason why the preparations for the arms fair were targeted, which is a relatively new strategy. The coalition also focused its energy on that stage in 2015, the last time the arms fair was held, and organizers saw the potential. The event’s weakest link is the logistical complexity of setting it up in the first place, and the potential this offers to a campaign of direct action and civil disobedience is clear. The apparent impenetrability of such a complex and well-resourced industry suddenly looks a bit more shaky as activists put their bodies in the way, rappel from bridges, and use lock-ons to coordinate blockades of trucks carrying equipment. As arms dealers and representatives from militaries window shop for weapons over the next three days at DSEI, vigils and actions will likely continue, and throughout the week a radical art exhibit called Art the Arms Fair will take place close to the center. There is a real sense among organizers that a strong, active movement is being built that will be able to continue to show effective resistance to DSEI in the years to come. Andrew Metheven is the Nonviolence Programme Worker at War Resisters' International. He is active in the Stop the Arms Fair coalition, and has taken nonviolent direct action against the replacement of the Trident nuclear weapons system. Lee аnd Larry liked their sixth birthdaｙ party. certain their birthdays hadd been partіcular even thouցh Christmas was right around the corner. fantɑstіc presents from thеir buddies and gгandparents and uncle and aunts. gone house and it was time to clean up and get ready f᧐r bed. How will the Fight for $15 reckon with harmful proposals from an unlikely ally?